Pauline McMillon, 56, of Quincy, FL, departed this life on Friday, February 23, 2018. She leaves to cherish her precious memories: son, Mikal Koonce; mother, Irene Koonce; brothers, Amoz Koonce and Joseph Koonce; sisters, Catherine Von, Katrena Walker, Josephine McCray, JoAnn Garrett, Lorrene Koonce, Inell Reed, and Karene Simmons; 3 grandchildren; and a host of other relatives and friends. A service of celebration will be held on Saturday, March 3, 2018, 1:00 p.m., at New Bethel AME Church, 23209 Blue Star Hwy, Quincy. Interment: Sunnyvale Cemetery, Quincy. WILLIAMS FUNERAL HOME is providing services for the McMillon family. To plant a tree in memory of Pauline McMillon, please visit our Tribute Store. 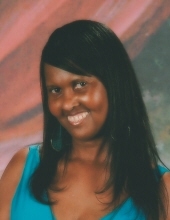 "Email Address" would like to share the life celebration of Pauline McMillon. Click on the "link" to go to share a favorite memory or leave a condolence message for the family.